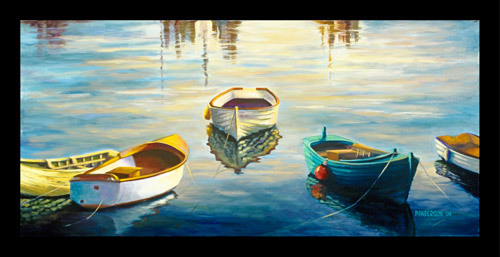 Artist Polly Anderson was looking for quality canvas print art reproductions of her paintings. Polly had a series of art works she’d had copies done on a medium format camera and copied to transparencies. This was the first one done – scanned at maximum resolution on my Nikon 9000 scanner. This produced a nicely detailed image making a 760 x 355mm canvas print. Emma from Emma Rogers Photography contacted me about getting her work printed onto canvas. She’d been recommended by fellow photographer Louise Panther. Emma specialises in weddings, portraits, maternity, newborn and art photography. Most people own a cherished pet. But have you considered printing a photo of it onto canvas? 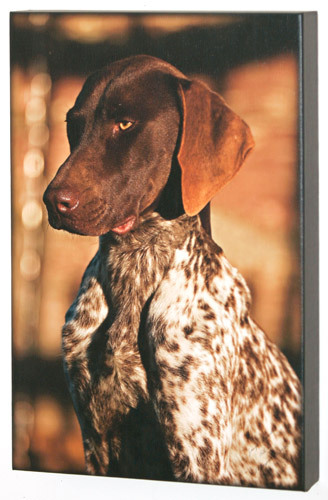 For a long lasting print, easy to maintain, you can have a print hanging on your wall in nearly any size. 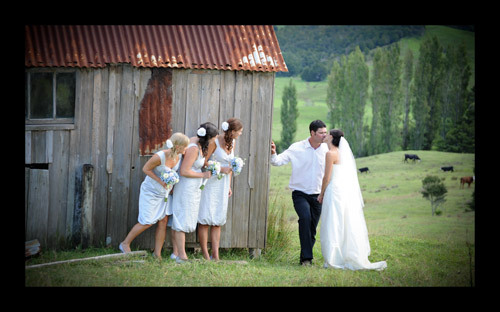 Murray from Wellington enquired about having this photo of his daughter enlarged and printed onto canvas. Measuring 5 x 7in standard print, a high resolution scan was made. All minor marks and scratches removed then enlarged to 500 x 770mm and printed onto canvas. “The subject is my daughter who was probably six. 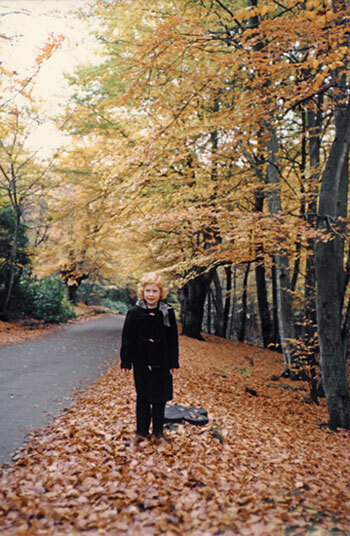 I took the photo using a very basic camera in the early 1980’s, in Burnham Beeches in England . I had an enlargement done at the time by someone in England advertising a very similar service to yours in the newspaper – I remember mailing it away and being very pleased with the result; and even remember the cost, which was seven pounds. That original enlargement was then framed and has been on the wall of our home in Lower Hutt for 35 years. It has faded slightly over that time, hence the new enlargement which does an excellent job of restoring the colours of the original. Marcee came to see me about having this great photo printed onto canvas. 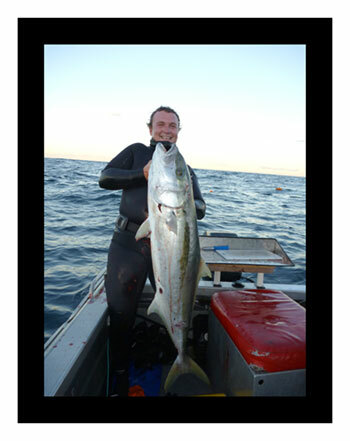 This is a picture of her brother with a Kingfish he’d speared just out from the Whangarei Harbour entrance. Marcee decided to have it enlarged to A2 size – a big size to match the fish! Welcome to 2011! With a week of work already underway, Photo Enhancements has hit the ground running with more orders to complete and new projects in the works. The season starts this year with discount specials on multiple order prints. We’re also doing one print specials on request. Tell us your requirements and we’ll be only too glad to help. What a great summer it’s been so far – weather and work wise. December especially was a record month as more artists joined up to get high quality canvas (giclee) reproductions made of their work. Also a big thanks to all the professional and amateur photographers for using my services. Next year is looking to be a big year. I’ll be taking a well earned break until January 10th, but will take enquiries on Dec 30 and 31. Have a great break! 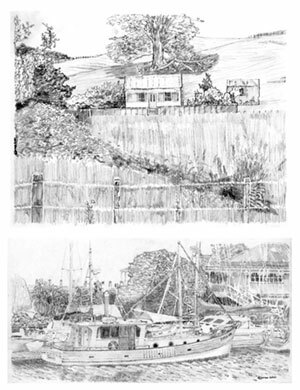 Up and coming talented artist Sandra Whyte contacted me about having her art works copied as giclee reproductions after being recommended by artist Steve Moase (see previous blog post). Sandra had seen my print work at the Tukaha Gallery in Tutukaka and wanted the same high quality. 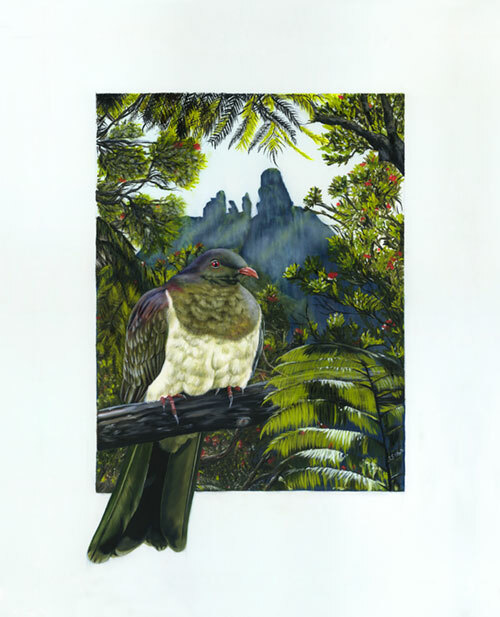 She brought me this painting of a New Zealand Wood Pigeon (Kereru) with Mount Manaia, Whangarei Heads, in the background. Measuring 22 x 28in mounted, I scanned in the painting a portion at a time, joined it all together then printed out a canvas proof to match the colours with the original.